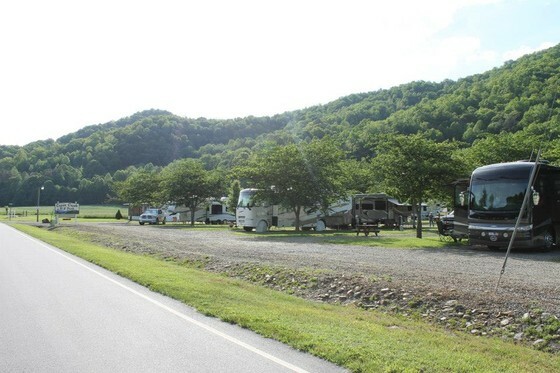 We are a quiet RV Park, for self contained rigs, open in the summer. There are no bathrooms or shower house, so no tents. All sites are 50 Amp, full hookup, city water and sewer. WiFi through out the park. Spectrum cable, WITHOUT the box! There is a fenced dog area. Obviously, good dogs are always welcome. Great walking, sidewalk to town and a mountain hike. Self Contained Units Only, no tents. No bathrooms or shower house. Cable. See the page about new cable system. Check out the Special Creek Side sites. Only available for daily or weekly. We now have 5 creek side sites available at daily and weekly rates. 32 Riley Loop is probably the best creek side site in town. 44 Riley Loop is a very close second place. Concrete patio, great creek side. Great site to book if you have a group coming, and this is your event site. See the last picture on the pictures page. 32 Riley Loop. Concrete patio. Up to 40 ft.
44 Riley Loop. Concrete patio. Up to 38 ft.
62 Riley Loop. Nice cozy site. 80 Riley Loop. Concrete patio. Up to 45 ft. Great for a toy hauler back patio! 86 Riley Loop. Concrete patio. Up to 45 ft. Great for a toy hauler back patio! We only have 5 of these special sites, so we think they are special, and try to let newcomers to Maggie Valley enjoy the creek. Regular rates are much less. Please see the Rate page. We will review your reservation request and apply all the discounts we can think of! If you are only looking for a week or so, check out the special creek side lots. Or, just call, and talk about your needs, and we will help you with your reservation. Lot of pictures and comments on Facebook. The Elk sometimes come in the park!